There’s a bit of good news for children with asthma, revealed in a study that tested whether kids wearing allergy masks would exhibit fewer asthma symptoms than those who simply stuck with their asthma medications. As many parents know, children with asthma can risk more frequent and profound asthma attacks when they are in situations where there is also risk for allergies. One study tested kids averaging 8 years old who all had allergies to dust mites. The kids wore allergy masks for four weeks while sleeping. Then they went without the masks for four weeks as well. The masks were cone-shaped and made of fabric, allowing the children to breathe well during sleep. Every participant in the study was already taking allergy medication, and kept doing so during the study. Some children still needed to use their asthma medicine during the study. Researchers counted the number of days each child needed their medication. In the weeks the children were wearing allergy masks, asthma symptoms were controlled more than 90% of the time. By contrast, the same children when sleeping without allergy masks experienced an average of 82% control. The benefit is significant enough for parents of children with asthma to consider using well-designed allergy masks to help children control asthma while sleeping. 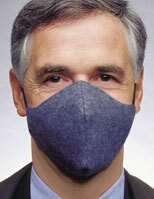 The masks also improved overall lung capacity as well as an effective asthma control device. Further study of the potential of allergy masks is needed, as the initial study involved just over 30 children with asthma made worse by dust mites. However the relationship between allergies and asthma is significant enough in statistical terms to recognize that any means of reducing allergy risk may also have beneficial effects on asthma treatment.